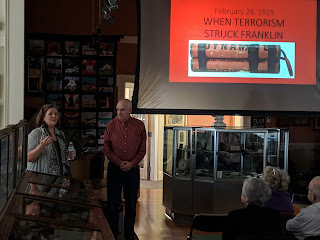 If you missed the Second Sunday Speaker Series at the Franklin Historical Museum on Sunday, Jan 13, 2019, you can review the slide deck here and while listening to the audio recording below. Franklin historian, Alan Earls is introduced by Mary Olsson, Franklin Historical Museum. This internet radio show or podcast is number 157 in the series for Franklin Matters. This recording shares the Second Sunday Speaker Series presentation given on Sunday, Jan 13, 2019. 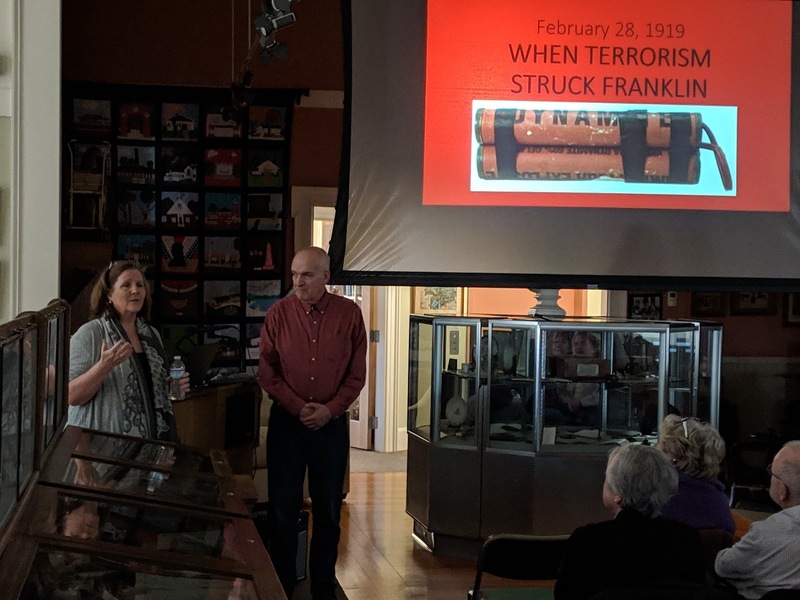 Franklin historian Alan Earls talks on "When Terrorism Struck Franklin: February 28, 1919"
The show notes on Franklin Matters will also include the presentation document so you can follow along. The total recording presentation and the follow up Question and Answer period runs about 55 minutes. Without further ado, here is the audio recording. In particular, if you have an interest in real estate, zoning or construction, I would like someone to follow the Planning Board, Zoning Board of Appeals, and Conservation Commission meetings. I’ll provide the guidance on note taking and sharing. You need to bring an inquisitive and open mind and willingness to learn and share.